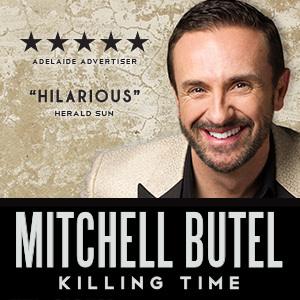 Neil Gooding Productions presents Mitchell Butell in Killing Time - tales of time from the jazz and blues songbooks. Killing Time premiered at Hayes Theatre Co as part of the Month of Sundays program in November 2014 to sell-out performances. A thousand dreams, a handful of loves, too many martinis and 24 hours packed into 80 minutes of song. Three-time Helpmann Award winner (and voice of the Playschool theme song to boot) Mitchell Butel returns to the Sydney cabaret stage after star turns in The Government Inspector, Angels in America, Orpheus in the Underworld, The Mikado, Forum, Gettin' Square, Meow Meow's Little Match Girl and Avenue Q in a hilarious and occasionally sentimental tale of 24 hours in the life of himself and of all our selves. Backed by a whitehot jazz trio led by Daryl Wallis, Butel weaves his way through a night of song including works by Ellington, Berlin, Jarreau, Bernstein, Mercer, Arlen, Elling, Sondheim and Parton...sorry, what, Dolly Parton? Really? ?